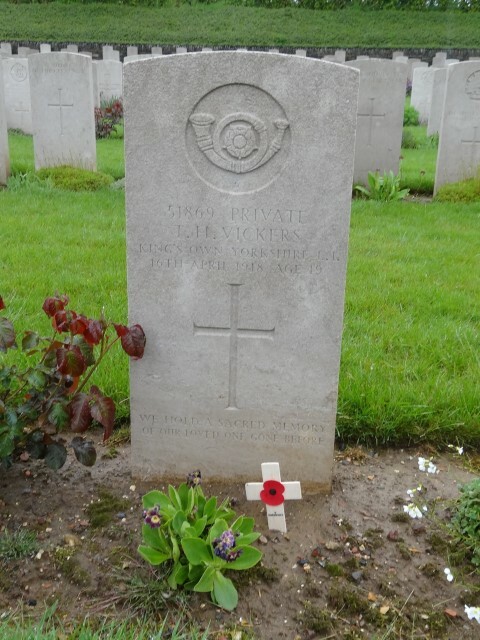 51869 Private Thomas Henry Vickers, 2/4th Battalion, the King’s Own Yorkshire Light Infantry was killed in action 16 April 1918 and is buried at Bienvillers Military Cemetery, France. He is commemorated on the St. Helen’s Colliery Memorial Cottages, West Auckland War Memorial and the Roll of Honour, Memorial Hall, West Auckland. He was 19 years old the son of William and Isabel Vickers. 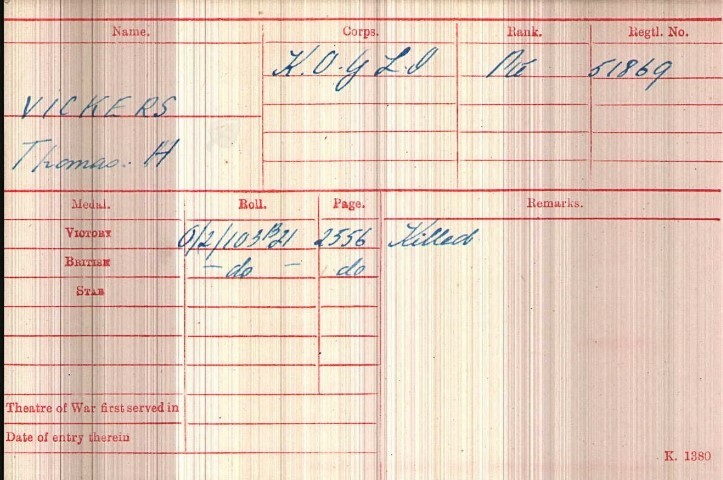 The service record of Private Thomas Henry Vickers has not been traced and the war diary of the 2/4 Bn., King’s Own Yorkshire Light Infantry (KOYLI) War Diary has not been researched. Private T.H. Vickers served with “C” company and was given the regimental number 51869. On 31 August 1914 the War Office issued instructions for all units of the Territorial Force to form a reserve unit. The men who had agreed to serve overseas were separated from the rest. Those left as ‘home service only’ were formed into ‘second line’ units, which would be this reserve. They were joined by many new recruits from September 1914 onward. The ‘first line’ 49th (West Riding) Division went to France in April 1915. It is assumed that Private T.H. Vickers was conscripted into service, attested in 1917 (possibly on his 18th birthday) and was sent to France in the spring 1918 as the German Spring Offensive took effect and British casualties increased requiring an urgent demand for new men at the front. He was killed in action 16 April 1918 along with 5 other ranks. The battalion was not involved in any specific named battle on that date and must have been killed as part of the usual violence of warfare – shelling or machine gun or sniper fire. Since another 5 men were killed on the same day, perhaps they were hit by artillery fire. Private T.H. Vickers was awarded the British War and Victory medals.